We wanted to let our customers know that we've processed a few more of our organic, grass-only beef cattle, and we now have plenty of lean-ground beef, as well as steaks and roasts, in stock. Something unique about grass-only beef is that it really does taste different, and personally we much prefer it. 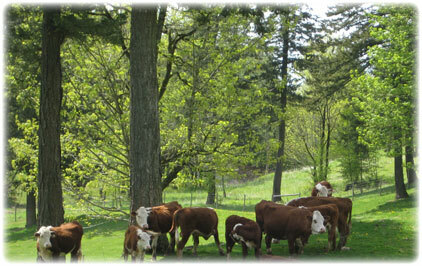 Yes, grass-only beef is far leaner than a grain-fed animal --- but that's not the only difference. We also believe it's much more flavorful. And, according to researchers, it's healthier too. This only makes sense. Cows are ruminants. They are designed to eat grass. And so that's what we feed them, and nothing else. Some of our cows, enjoying the sunshine, and living the way they're supposed to. is the meat healthy for people to eat? do the cows live pleasant lives, as cows were designed to live? does the meat taste good? We're grateful to have customers like you. As we often say, we have the best customers in the world. Thank you so much for supporting local, certified-organic family farms!